Dressed to thrill. Organiser Nicholas Pellett, Nick Canfor and Caroline Sibley. Brooklands, November 29, 2017: De Dion Bouton Tricycles are lined up on the start-finish straight opposite the clubhouse to celebrate an event that took place 120 years ago to the day, and 10 years before the famous banked concrete oval was built. Twenty riders are here to commemorate the first motor race on British soil. But this is no static display – they are here for the thrill of competition. 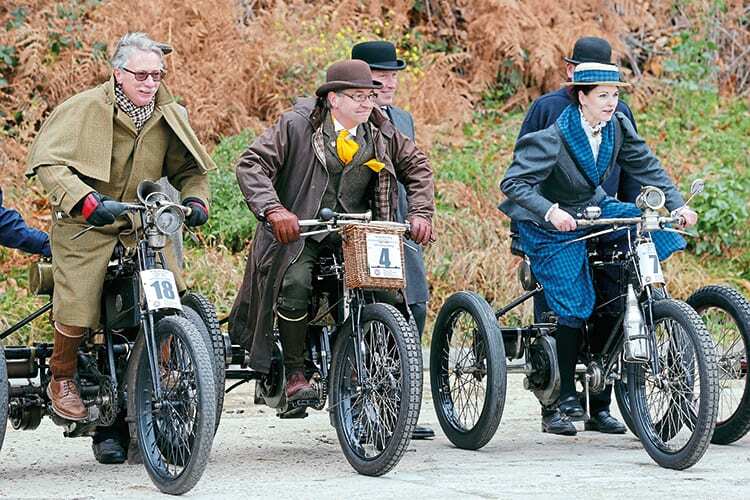 “We are running two heats, and then three races over distances of up to five miles,” says Nick Pellett who created ‘Team Jarrott’ for the De Dion Bouton Club UK and is the organiser of the celebrations. Designed by Frenchman Georges Bouton and bankrolled by Count Albert de Dion, the first single-cylinder De Dion Bouton engine was ready for the road by 1895. With a capacity of only 137.5cc, the four-stroke single could rev to an unheard of 3000rpm and develop half a horsepower. This was only possible because Bouton had invented a high-tension ignition system with a mechanical make-and break device. Fixed to the back of a pedal tricycle the little engine propelled the considerable bulk of the count to a heady 20mph.